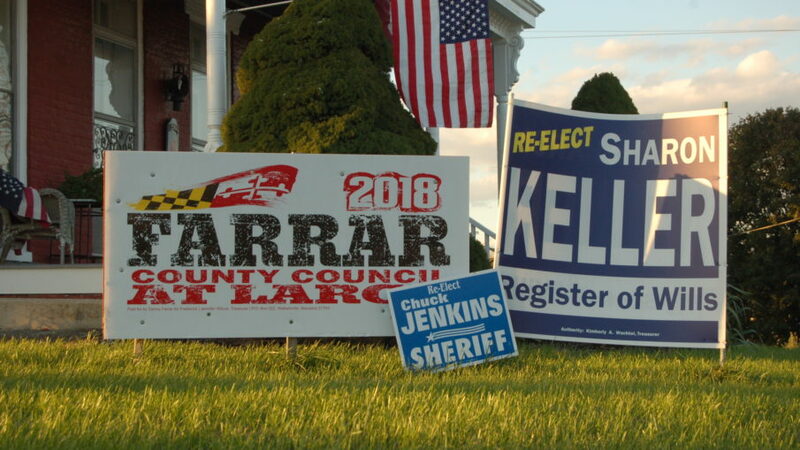 Campaign signs outside a house on Main Street in Myersville. Why do students choose not to vote in political elections when they make up the majority of the voting population? According to a poll from the Public Religion Research Institute, the Atlantic, and the Washington Post, only 28 percent of young adults say they are absolutely certain that they plan to vote in the 2018 midterms. This is a harsh comparison to the 74 percent of seniors who have said the same. Another study conducted by Harvard Institute of Politics predicts that 70 percent of the voting population under the age of 30 will not show up to the polls on November 8th. 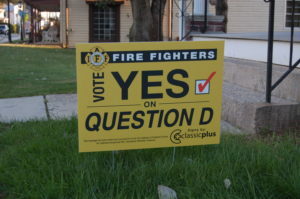 A campaign sign outside a house on Main Street in Myersville. The numbers might seem staggering, but it makes apparent that many students have trapped themselves in a mindset of unimportance when it comes to elections and fail to realize the effect they could have on the political climate. According to different research by PRRI, 57% of Americans do not believe their vote matters. Millenials are expected to surpass the Baby Boomers as the largest eligible voting population by 2019, which gives them a significant amount of power, but young people do not see their votes this way. According to studies conducted by the CIRCLE, 17 percent of young voters feel like they “don’t know enough” to vote, thus resulting in a lack of political exploration. Anne Hoffman, associate professor of English and founder of “Parents Lead,” shares her experience on why students choose not to vote. In a society that is a whirlwind of political activity, many people deem it hard to find reliable, unbiased information that is crucial to gaining a clear political consciousness. A study by the CIRCLE shows that the majority of young adults get their information from social media, with up to 60% from Facebook. Hoffman instead suggests that political engagement should begin at home. Another study by the CIRCLE shows that 42 percent of young people learn about the midterms from their family and 52 percent say they are extremely likely to vote after hearing from their family. 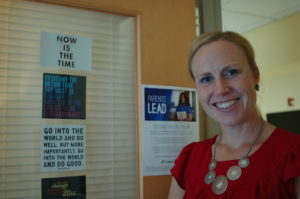 Hoffman strongly advises students to take classes like history and sociology that explore topics relating to politics in order to become educated and involved. Dr. Bruce A. Thompson, PhD/J.D., poses in his office. 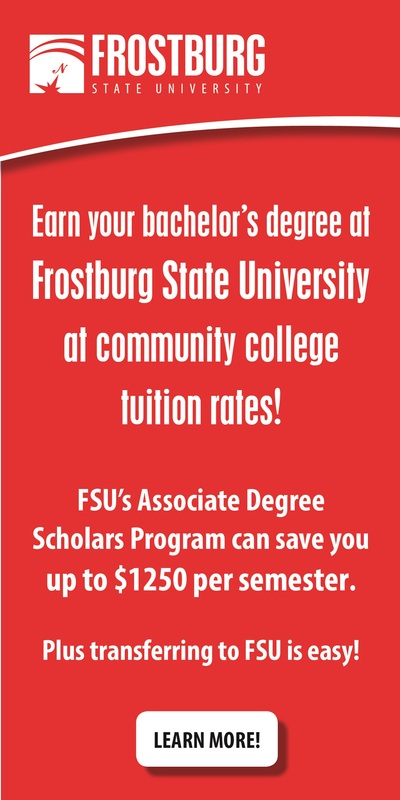 Dr. Thompson is a professor of history and the honors coordinator at Frederick Community College. 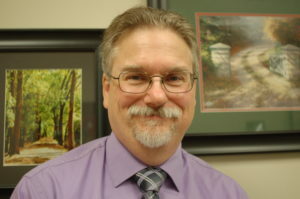 Dr. Bruce A. Thompson, professor of history and honors college coordinator at FCC, recommends becoming informed by consuming as much information from as many different sources as possible, left and right, American and foreign, in order to gain the widest perspective and clarity of the situation. Hofmann advises to find an issue that is interesting or personal and start there. No matter what method is used to get there, the importance is simply the aspect of taking the step to get educated and involved. There is also the issue of time. According to studies by the Pew Research Center, 67 percent of non-voters said they were not able to vote in the election due to their lack of time. 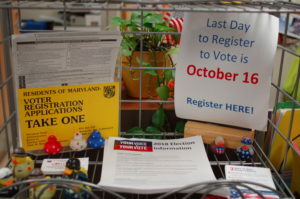 “When you’re a young person and you’re managing a lot of things, I can understand how voting seems less important than when you’re older and maybe have more money, schedule flexibility, and possibly even more passion because you’ve watched how the vote has impacted your life over a longer period of time. I can see why it’s different between the groups,” Hofmann said. 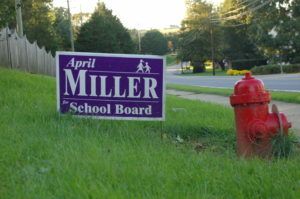 A campaign sign on Main Street in Myersville. These issues often keep young voters away from the polls, and ultimately leave the political fate of the country in the hands of older generations, instead of the ones who are about to inherit it. “College-aged students are going to be living out the consequences of these elections for a long time versus someone who is a lot older and might only be impacted by the political consequences of the vote for a short amount of time,” Hofmann said. So, it’s time to get involved! Register to vote, and encourage friends to do so as well. A study by Yale University shows that people were 8.1 percent more likely to vote when learning their voting history in comparison to their peers. There is strength in numbers and peer pressure works wonders when it comes to encouraging young people to vote. There is proven power in the voices of young people. From the Vietnam War protests to the recent advocacy for stricter gun control laws, students have shown the strength that appears from banding together and working for change. A shelf in the student engagement office (H101) in the student center at Frederick Community College. The office for student engagement offers many resources and actively encourages students to participate in elections. 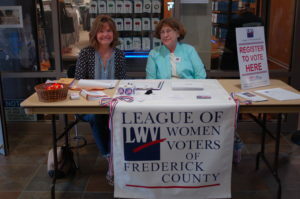 Sue Krause (Left) and Carole Christian (Right) sit at their table for the League of Women Voters of Frederick County on October 4th in the student center. LWV has been in operation for 70 years and provides non-partisan views and background information about all of the candidates during an election.